F. H. Bradley (1846-1924) was the foremost philosopher of the British Idealist school, which came to prominence in the second half of the nineteenth century and remained influential into the first half of the twentieth. Bradley, who was educated at Oxford, and spent his life as a fellow of Merton College, was influenced by Hegel, and also reacted against utilitarianism. He was recognised during his lifetime as one of the greatest intellectuals of his generation and was the first philosopher to receive the Order of Merit, in 1924. 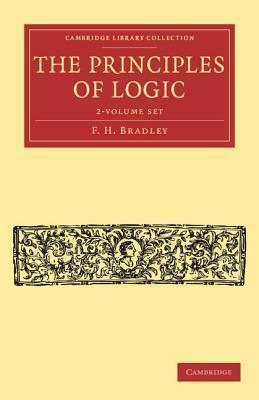 In this major work, originally published in 1883, Bradley discusses the basic principles of logic: judgment and inference. He rejects the idea of a separation between mind and body, arguing that human thought cannot be separated from its worldly context. In the second edition, published in 1922 and reissued here, Bradley added a commentary and essays, but left the text largely unaltered. Volume 1. Preface; Preface to first edition; Book I. Judgment: 1. The general nature of judgment; 2. The categorical and hypothetical forms of judgment; 3. The negative judgment; 4. The disjunctive judgment; 5. Principles of identity, contradiction, excluded middle, and double negation; 6. The quantity of judgments; 7. The modality of judgments; Book II. Part I. The General Nature of Inference: 1. Some characteristics of reasoning; 2. Some erroneous views; 3. A general idea of inference; 4. Principles of reasoning; 5. Negative reasoning; 6. Two conditions of inference; Book II. Part II. Inference Continued: 1. The theory of association of ideas; 2. The argument from particulars to particulars; 3. The inductive method of proof; 4. Jevons' equational logic. Volume 2. Book III. Part I. Inference Continued: 1. The enquiry reopened; 2. Fresh specimens of inference; 3. General characteristics of inference; 4. The main types of inference; 5. Another feature of inference; 6. The final essence of reasoning; 7. The beginnings of inference; Book III. Part II. Inference Continued: 1. Formal and material reasoning; 2. The cause and the because; 3. The validity of inference; 4. The validity of inference continued; Terminal Essays: 1. On inference; 2. On judgment; 3. On the extensional reading of judgments; 4. Uniqueness; 5. The 'this'; 6. The negative judgment; 7. Of the impossible, the unreal, the self-contradictory, and the unmeaning; 8. Some remarks on absolute truth and on probability; 9. A note on analysis; 10. A note on implication; 11. On the possible and the actual; 12. On theoretical and practical activity; Index.